Gardener Hopes for 'Resurrection' of the Axed Tree on West End Ave.
UPPER WEST SIDE — A beloved neighborhood tree hacked apart by a mysterious “ax murderer” has a miraculous shot of survival thanks to a local gardener. The attack on the towering gingko — which had a portion of its bark stripped by an unknown assailant — shocked neighbors who awoke to what they likened to a “murder scene” on West End Avenue near 103rd Street in late March. But on Easter Sunday, gardener Costello Caldwell said he undertook “the resurrection of the tree” by grafting bark from another part of the gingko onto the section that was ripped off. Caldwell took two thin strips of bark from the base of the tree and used screws to attach the strips to the damaged portion in an effort reconnect its nutrient-delivery system. “I’m not a surgeon, but I feel like it was surgery,” he said. After the attack, neighbors left poems, flowers and candles by the tree, as well as announcements wondering who committed the crime, which Parks Department officials said is considered a misdemeanor. “It’s like a murder scene,” Caldwell said last week amid scraps of bark scattered on the ground and the police tape neighbors put up to block off the tree pit. Detectives from the 24th Precinct do not have any leads and haven’t identified any witnesses, said Capt. Marlon Larin, the precinct’s commanding officer. “It’s senseless. It’s arborcide,” added Barry Wittenstein, a 20-year resident, who added that the community is still reeling from the attack. “The person [who did it] clearly has an ax — it’s like there’s an ax murderer in the neighborhood,” said Constantina, a neighbor who did not give her last name. “It made you feel like you were living in a crime scene,” added Molly Hill, who lives on the block. A Parks Department spokesman said the stripping caused irreparable harm to the tree and that staffers plan to plant a $750 replacement sometime in the fall. But there’s hope the injured gingko will make it after all. The bark Caldwell stripped and reattached was moist, a sign the tree can be saved, he said. He also covered the damaged section with a garbage bag to protect it from harmful sunlight in a way that still allows the passage of air. 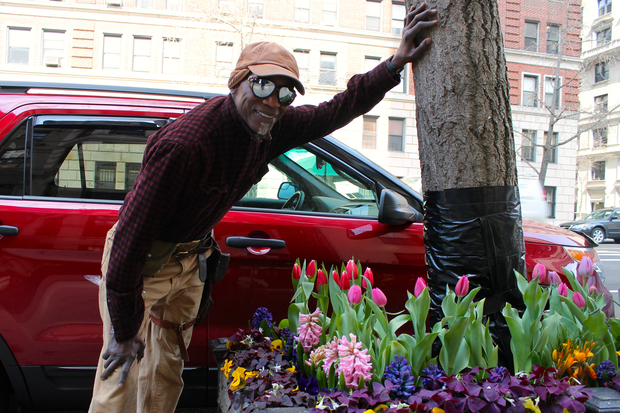 In addition, the gardener planted hyacinths, peonies, tulips, and pansies in the planter box he originally constructed around the trunk. Caldwell will check on the progress at the end of April, but said he’s very optimistic it will lead to new bark growth and improved health for the tree. “From what I was feeling, I could tell the operation was successful,” he said. Police ask anyone with information to come forward at the 24th Precinct.